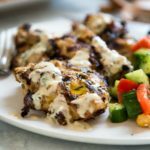 Tahini Marinated Grilled Chicken is not over powering in sesame flavor, but the tahini adds an almost tenderizing quality to the chicken and amazing flavor. Adapted from Cooking Light. Prep time does not include 8 hours to marinate. In a medium sized bowl combine the oil, tahini, shallot, garlic, salt, red pepper flakes, herbs, water and lemon juice and zest. Stir to mix well. Scoop out 1/4 cup of marinade and set aside. To the reserved marinade, add 2 tablespoons of Greek yogurt and 1 tablespoon of water and mix. Cover and refrigerate until serving. In a large gallon sized ziplock bag add the chicken and pour tahini marinade over, seal and massage with hands to coat. Refrigerate 8 hours or overnight. Preheat your grill to 400°F. Clean grill and coat with cooking spray. Shake excess marinade from chicken and grill and cook 2-4 minutes per side depending on thickness of chicken, covered. Discard marinade and bag. Serve with reserved marinade drizzled on top. Shallots vary in size, but you will need about 1/3 of a cup total. Typically it’s about the juice from half a medium sized lemon.